There are many legendary games in the Middle Ages with professed losses of clothes, horses and, what is more, whole estates, and even halves of kingdoms. But was money really the most important part of gambling? 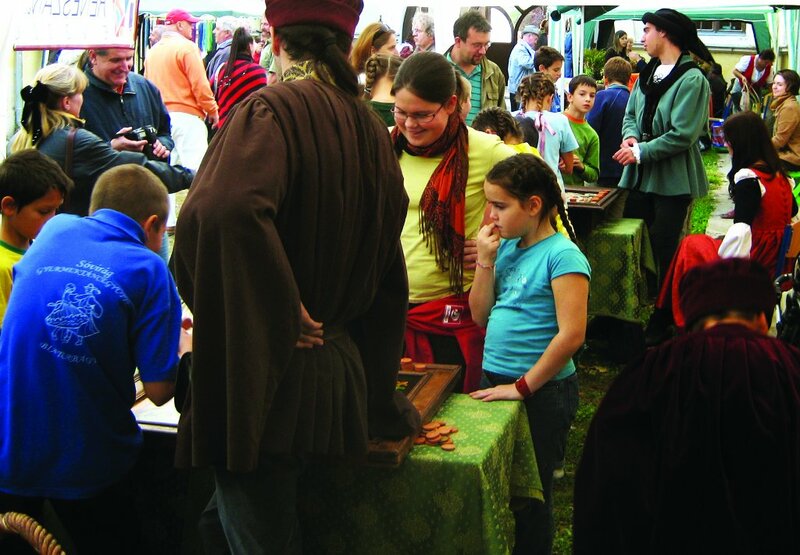 Our team reconstructed several medieval types of gambling, and we have been playing with people at festivals and company events since 1998. In our Medieval Casino we play with tokens instead of money, and people win gingerbread or small presents. While these prizes have no real value, people still love these games! What kind of gambling games did they play in the Middle Ages? The games that you can find in modern casinos like Roulette and Black Jack go back to the 18th and 19th centuries, they have no direct link to the Middle Ages. However there were lots of exciting forms of gambling in the Middle Ages (more than nowadays) but they have been totally forgotten by modern people. 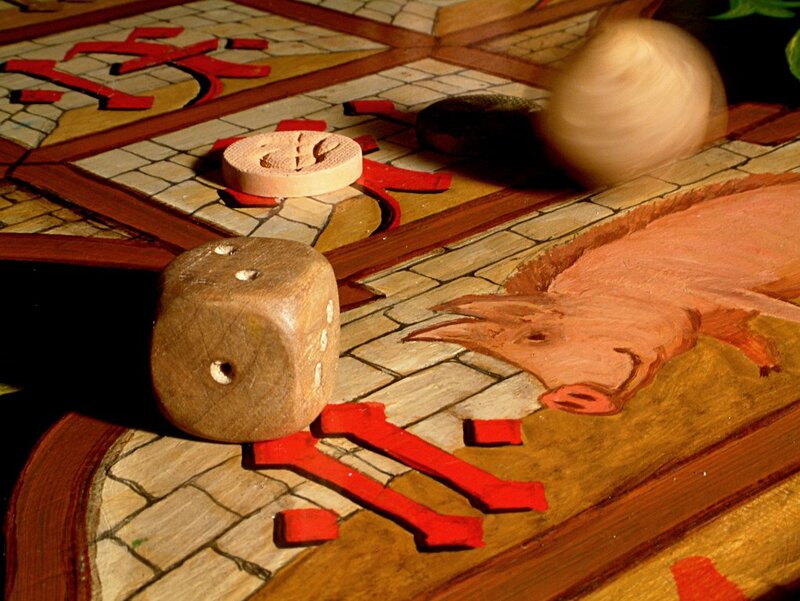 The board games with dice were developed in the second part of the Middle Ages. In contrast to tactical board games (such as the chess or backgammon), to play these games you need only fortune, not intelligence or talent. 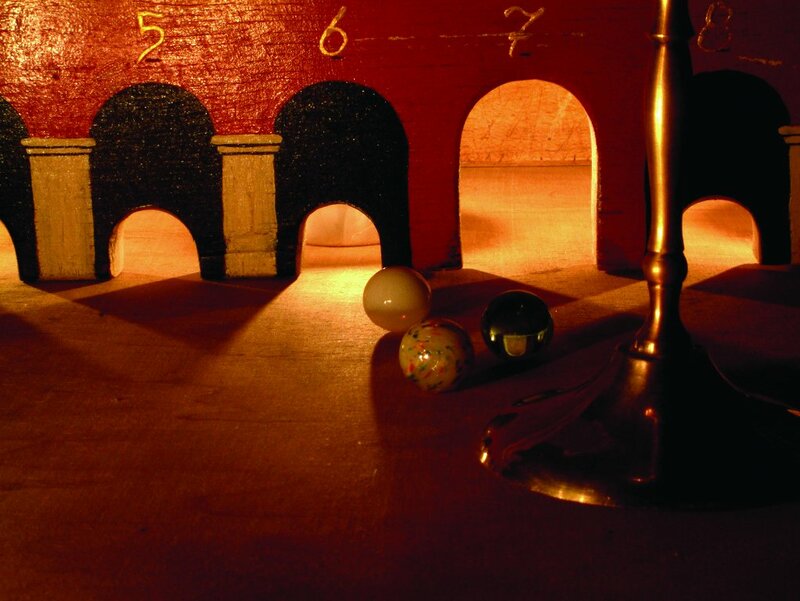 For example, the House of Luck is one of the simplest, but most popular, games. People can play continuously for hours not influenced by age or qualification. John of Salisbury (circa 1120-1180) tells of about ten types of dice games. The aim of these games was to perform a definite combination of casts, not simply to achieve the highest score. Most of them were played with three dice. 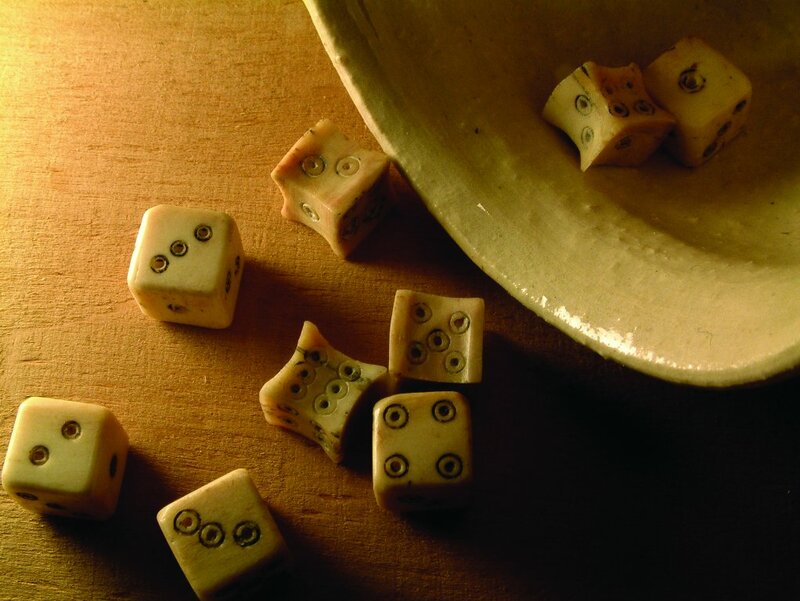 Medieval dice are known from archaeological excavations. Dice made from bone were smaller than those used nowadays. Knowing the size of the medieval dice, it is easier to understand the order of Buda’s town council regarding punishment for cheating with dice. According to the Buda Right Book (the beginning of the 15th century), the punishment for playing with false dice was to pierce the die through the palm of the cheater. It is hard to imagine with today’s large dice with their rounded edges, but it could have been done easily with the small Medieval cubes with a sharp edge. The Medieval punishments were logical, in that they served to deter the criminal from cheating again. If the die was pierced through somebody’s palm, anybody could see the wound as the proof of cheating, and nobody wanted to play with that person. However, there is no data referring to this punishment being actually used. The popularity of dice games decreased during the 15th century, and playing cards became the most popular way to gamble. 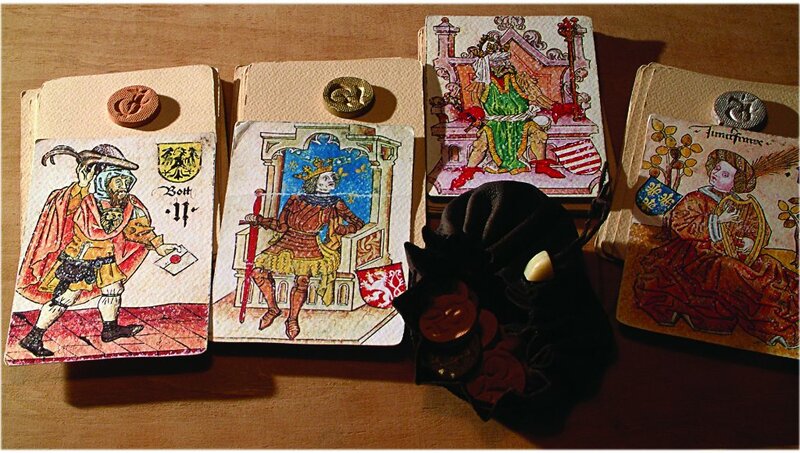 Cards were introduced to Europe from Asia and the Arab world in the middle of the 15th century, and within a century they spread all over Europe. A variety of the games were played, and the complexity of some of them was amazing. There is a reason for such a large number of card game types. Playing with cards was often forbidden in European towns. As soon as a game had been written to the prohibitive list, the next day people had made a tiny change to it and started to play it under a new name. 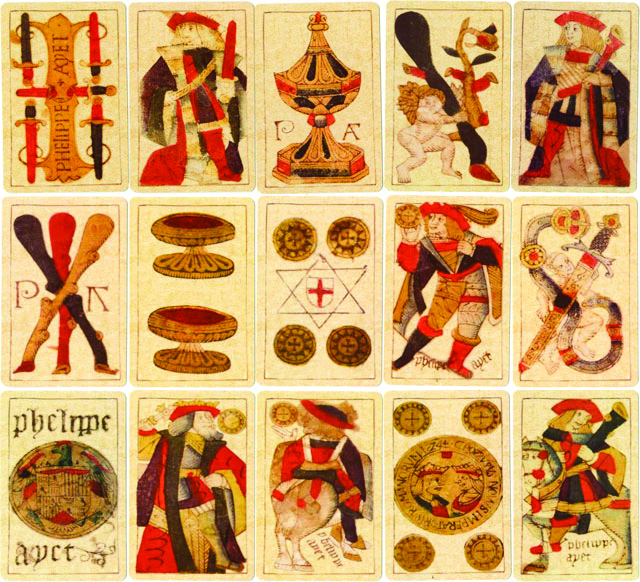 The first known playing card signs used in Europe were: sabre, cup (chalice), cudgel and coin. In Italian they were spada, coppa, bastone and denaro. In the 15th century the Germans started to produce and trade cards in large quantities at a low price, and they invented their own signs. At first there were signs of all kind, products of the rich imagination of the artists: pea, pink, grape, pomegranate, book, monkey and other animals et cetera. A beautiful example is the Viennese Court’s Card from 1460s. The signs of this card are the crest of Hungarian, Czech, Austrian and French kingdoms. After this attempt, the final version was formed within a short time: the German signs are the Herz [heart], Grün [leaf], Schelle [bell], and Eichel [acorn]. Parallel with the formation of the German signs, French signs were born: Tréfle [club], pique [spade], coeur [heart] and carreau [diamond]. Unfortunately we do not know of a complete pack of French cards before the 17th century. When we perform at markets and festivals, we play 12 different medieval card games, using both the German and French signs. Our card packets are copies of original ones. We have a beautiful Card Roulette board that is a copy of a German original preserved by the Bayerisches Nationalmuseum. The rules of this game are unknown, so we developed a game that is exciting and amusing for players. 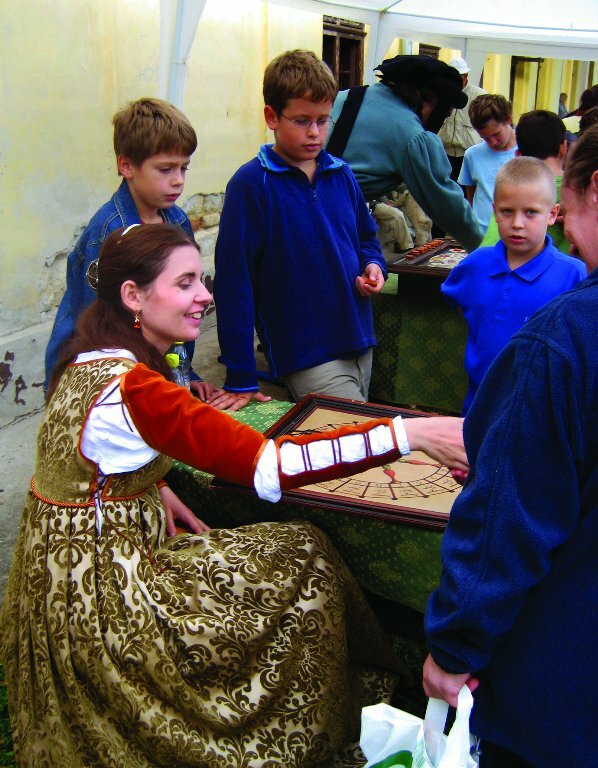 As an archaeologist and historian I have been interested in medieval games for more than ten years. During my research I realised that uncovering these medieval games is a long, drawn out process. A part of them is known from the written sources; juristic documents from different European towns, writings and books on education of aristocratic children, moral admonition works of churchman-authors, literary works of Bonfini, Shakespeare, Rabelais, Comenius and others. But usually these sources are laconic concerning the details – such as the rules. Moreover, we cannot know from the written sources what these games looked like. 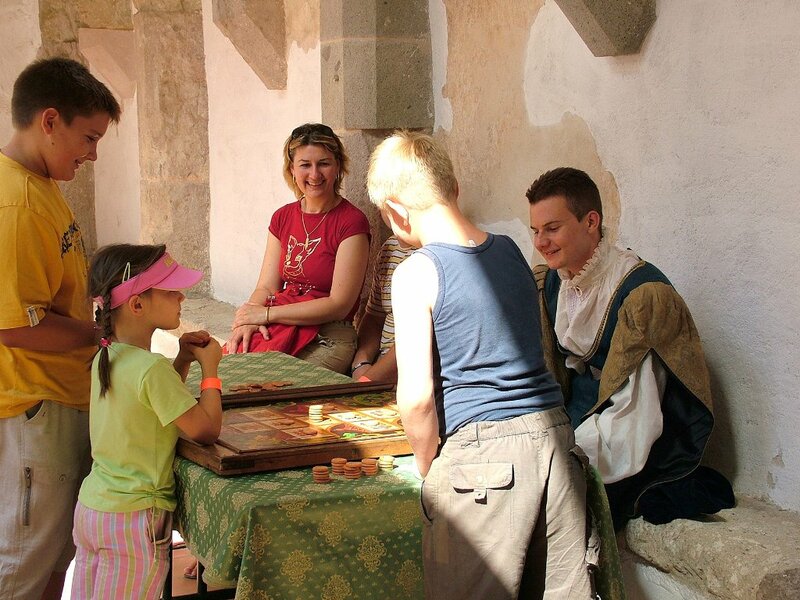 Another source of knowledge can come from game boards now located in different European museums. Unfortunately, no one usually knows how to play these games. We can rarely assign information from written sources, such as the names and rules of the games, to artefacts with certainty. Instead, we have found out some rules from sources and reconstructed some game boards. The casino isn’t as old as medieval gambling. The term ‘Casino’ has an Italian origin, and means Casa [house] a small country villa, summerhouse or pavilion. The word changed to refer to a building built for pleasure, usually on the grounds of a larger Italian villa or palazzo. Such buildings were used to host civic town functions - including dancing, music listening and gambling. One of the first known casinos was the Casinò di Venezia, established in Venice, Italy around 1638, and it is still in operation. During the 19th century, the term ‘Casino’ came to include other public buildings where pleasurable activities took place. 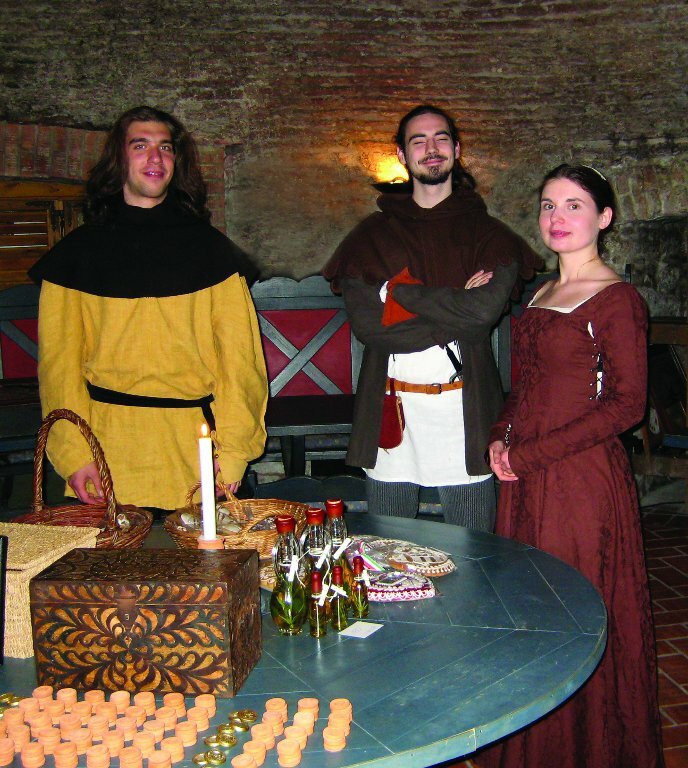 The medieval people played at the ‘taberna’ or at home. ‘Taberna’ means pub in medieval Latin. There was not a set dealer or croupier. Instead, if somebody had to shoulder the role of bank on the basis of the game’s rules, this role was taken in turns among the players. One player played against the others. For our modern purpose, it is easier to make the rules and system of these unknown (forgotten) games understood if they are organised on a modern casino’s system: there are tables with games, and each table has a croupier/dealer wearing medieval costume, who leads the games. Fig 2. Dice made from bone. Fig 4. Viennese Court’s Card. Fig 6. Card Roulette from 1583. Fig 8. 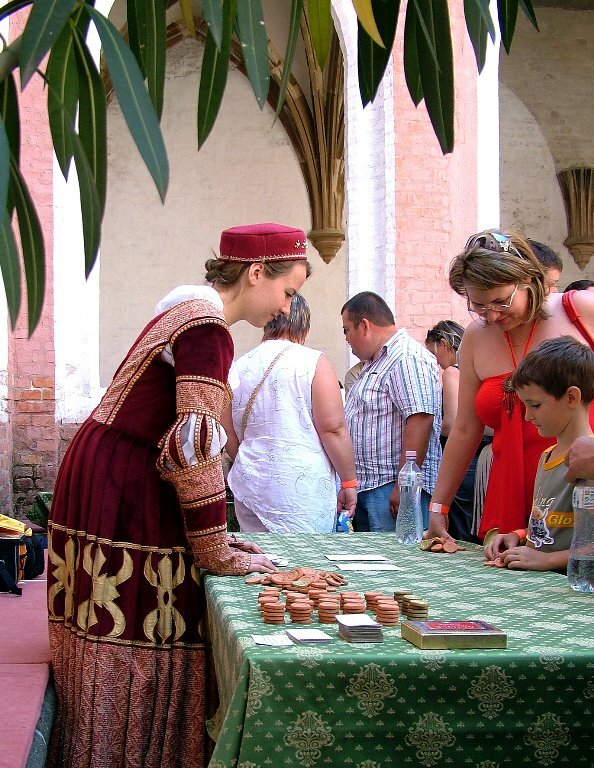 Playing at the Medieval Casino. Fig 9. Playing at the Medieval Casino. Fig 10. Playing at the Medieval Casino. Fig 12. 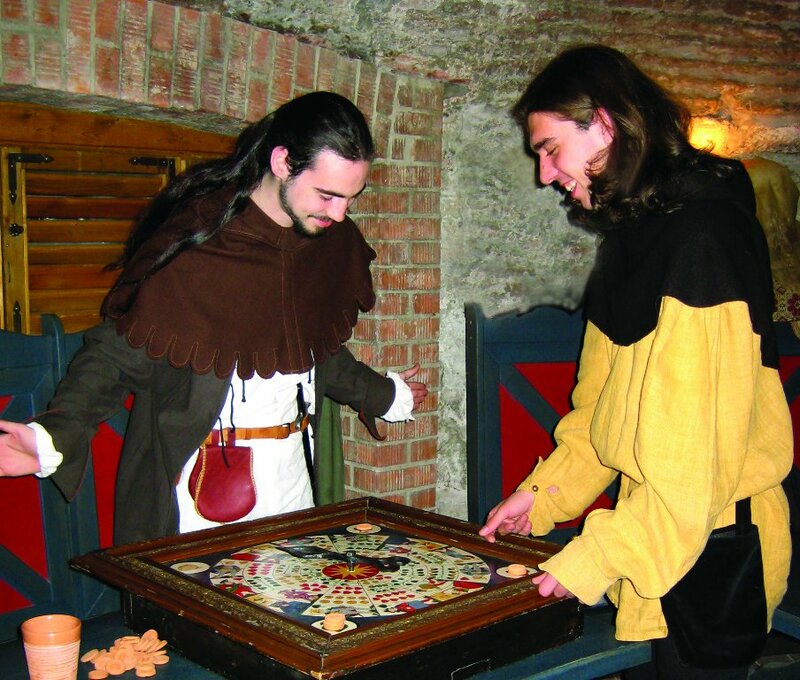 Playing at the Medieval Casino.